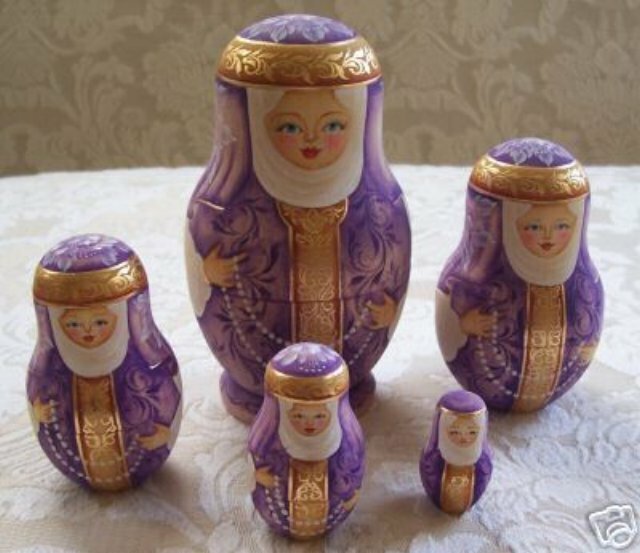 Authentic set of 5 hand painted nesting dolls. The largest is signed by the artist & dated 1999. Absolute mint condition, they have never been on display. Largest is approximately 6 inches tall and 3 inches in diameter. I do not know much about the image on the dolls except that it is not a typical Matryoshka design and the colors are not typical either. Research from the Sunbirds website indicates that this is a Russian Wedding Dress from the 19th century.